A damaged freight train sits stationary on the tracks near the Great Belt Bridge after an accident involving an express passenger train on January 2, 2019 in Nyborg, Denmark. Two more bodies have been found in the wreckage of a train crash on a Danish bridge, raising the death toll to eight in Denmark's deadliest train accident in 30 years, police said Thursday. All of the dead and injured were on a high-speed passenger train traveling on the Storebaelt system of bridges and a tunnel that link the central Danish islands of Zealand and Funen. Authorities are investigating if falling cargo from a freight train traveling in the opposition direction smashed into the passenger train on the bridge. Police said in a statement the latest bodies were only found after the wreckage was pulled away from the crash site to a remote area near the town of Nyborg on Funen island. They said the damage "was so extensive it has hard to properly get into the most damaged area" while the train was still on the bridge but added they are certain no more bodies are inside the train. Divers also searched the seabed under the bridge overnight, looking for train wreckage and more clues to explain the deadly accident. Aerial TV footage and photos showed the front side of the passenger train ripped open. One container seemed to be missing from a flat wagon on the cargo train. Crates of beer were on the freight train and a tarpaulin on top was torn into pieces. 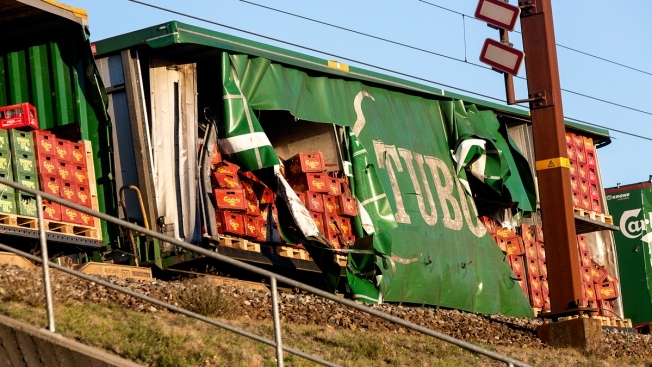 Lars Braemhoej, a senior police official, has said that investigators believe one possible cause of the "considerable damage" on the passenger train was getting struck by cargo detaching from the freight train. Still he said authorities "do not know precisely what caused the accident."